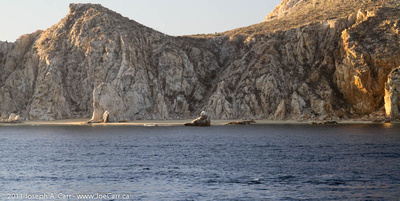 Today we are enroute from Huatulco to Puerto Vallarta, sailing up the Mexican Pacific coast. I go for breakfast in La Fontaine dining room this morning, and am seated with a table of veteran cruisers. They are all talking about their various experiences on ships. I am a two star Mariner in Holland America’s loyalty program, and most everyone else has either two stars or three stars. Nobody has achieved Four Star status yet, which is the top level for Holland America cruisers. I am invited to the 11AM sitting of the Mariners Luncheon, where I see the captain for the first time in this voyage. He greets me as I enter La Fontaine dining room. They pour us some champagne, the captain welcomes us, and then Thom the Cruise Director makes a few remarks about Holland America’s ships and loyalty program. The lunch is nice, and I meet some interesting people at the table. One couple from Michigan has visited Hawaii 16 times. She was on an African safari to South Africa, Botswana, and Zimbabwe, and really liked it. I share that I also did a safari in the same area a few years ago. 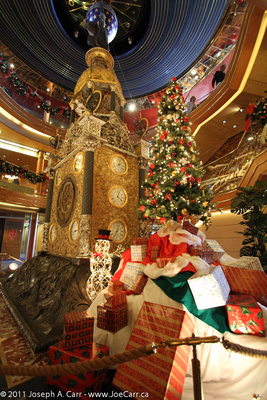 The ship is decorated for Christmas, with some impressive displays around the giant clock in the atrium, as well as a huge gingerbread house, and a sequencing Christmas sign stretched between the twin stacks outside. I understand there will be over 100 children boarding the ship when it departs San Diego in a few days, so their families’ Christmas aboard ship will be assured to be special, particularly when Santa shows up in person. My friends and I go up to the Lido for dinner, and decide to sit on the semi-open deck around the pool, where we can watch the beautiful sunset over the ocean. We had hoped there might be a Green Flash visible tonight, but no joy since there is quite a bit of sea fog near the horizon. Later, I go up to Deck 10 forward and do a bit of astronomical observing. Visually and with my Canon IS binoculars I see: Jupiter (2+2 moons) directly overhead, Venus near the horizon, Orion Nebula and constellation, M45 the Pleiades, M31 Andromeda Galaxy, Cassiopeia constellation, and Cygnus constellation. As my eyes adapt to the dark, I can also see the Milky Way.